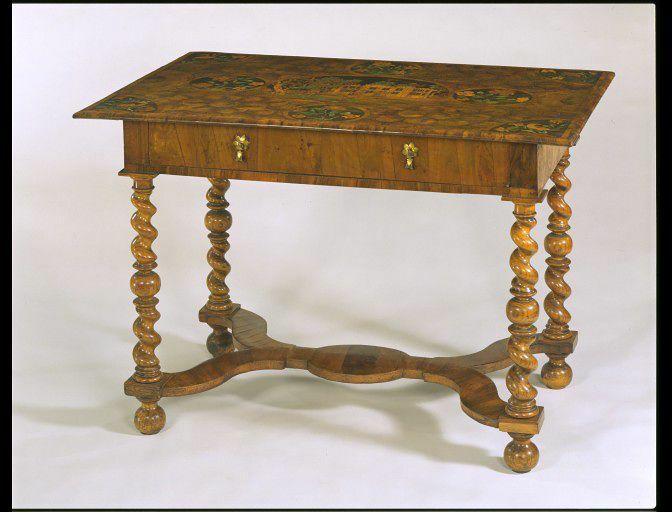 This table is similar in form to a standard pier table, which was supplied with a matching mirror and a pair of candlestands, and usually stood against the wall between two windows. However, the back of the table is also veneered with walnut, which suggests that it was positioned in the centre of the room. The Hunlokes were a Roman Catholic family in Derbyshire. The Tyrwhitt family came from Ketleby in Lincolnshire. Wingerworth Hall with its turrets and surmounting battlements was the home of the Hunloke family. It was built in the 1580s and resembles the work of Robert Smythson, whose great house Hardwick Hall was built only a few miles away. The marquetry portrait provides a unique representation of the original Wingerworth Hall, since it was rebuilt in the 1720s and demolished in the 1920s. The table was photographed in the Oak Drawing Room at Wingerworth for Country Life magazine in 1910. The scene is set by a border of banded walnut. The adjoining circular compartments contain sprays of flowers, three of them identified as roses (right), anemones (left) and daffodils (top). The spandrels in the corners contain birds including a jay (bottom left). A marquetry table, the top with a central oval compartment containing a scene of Wingerworth Old Hall, Derbyshire with in the foreground, heraldic figures of a savage man and a cockatrice, representing the crests of the Tyrwhitt and Hunloke families. This scene is framed by a border of banded olive wood and set in a ground of oystered olive veneer on an oak substrcuture. Four adjoining circular compartments contain sprays of flowers, of which three have been identified as roses (right), anenomes (left) and daffodils(top). The spandrels, also framed by banded olive wood, contain representations of birds including a jay (bottom left). The underside of the table is scored with a different geometric configuration presumably an alternative design for marquetry decoration executed on the upper surface. A single frieze drawer has two brass pendant handles. 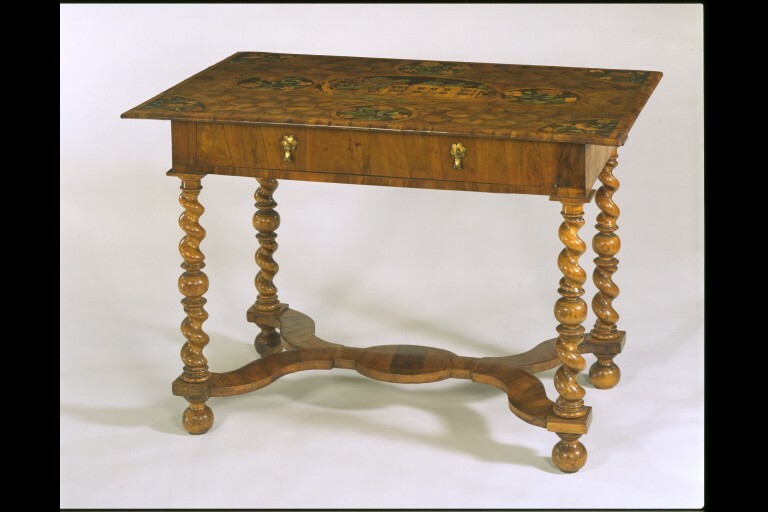 The back and side friezes of the table are veneered with olive wood suggesting that this was used as a centre table. The table is supported on four turned single-bine spiral legs with central ball on original bun feet. The wavy double-y stretcher is constructed of pine and veneered with valnut. The table surface is chamfered off underneath on oak although the table frame is pine as is the drawer front. The battens, back and sides of the drawer are oak. Oak was probably selected for the table top because it is more resistant to worm and slightly more stable (although there is evidence of shrinkage). The blocks at the sides are crude. The front of the drawer is veneered with walnut - the oyster veneer is probably walnut - the edging is also in the form of oyster veneer. The twisting strapwork , which frames the marquetry medallions, is also banded in walnut. The stretcher is set back from the corners. The table is veneered on the back and could have been intended as a centre table, although the stretcher is not veneered on the back. The stretcher is constructed of five pieces of pine - in halving joints. The veneer on the oval of the stretcher is tucked into straights and thus held in place. Same device is used on the curved corners of the stretcher where the veneer is held in place by corner pieces (needs a drawing or diagram to explain). There is evidence of subsequent restoration to the table top - a graft cleat holds two pieces together. The turned and carved legs are very probably ash. It appears that they have been partially stripped of a dark stain. The bun feet are original, and presumably of the same wood as the legs. The ground of the marquetry panels appears to be ebony veneer. The leaves are bone dyed in green. The brighter green may be the result of subsequent staining possibly in the V&A workshops. The paler wood used for the house may be sycamore or holly. The trees may be plane wood, the wood of the green man's club is speckled. Some of the flowers may be padouk wood. The bird has a pearwood body and beak of ebony. The table commemorates the marriage of Sir Henry Hunloke (1645-1714) to Katherine Tyrwitt (1657-1737) on 28th January 1673/4. The table may have been designed to contain the marriage settlement which was dated 27th January 1673. Katherine was the sole heiress of the Tyrwhitt family whose seat was Ketleby in Lincolnshire. The savage man represents the Tyrwitt family crest (a savage man proper cincinctured and wreathed vert holding in both hands a club). Wingerworth was the seat of the Hunloke family who were recusants. The cockatrice represents their crest (on a chapeau azure turned up ermine a cockatrice with wings expanded proper combed beak and wattled or). The representation of the house with its turrets, symmetrical elevation and surmounting battlements reflects the influence of the Smythsons. Wingerworth was only a few miles from another Smythson house, Hardwick Hall. (Mark Girouard, Robert Smythson & The Elizabethan Country House, 1983, pp.276-7, fig.194, footnote 36. ) The Hall was rebuilt in the late 1720s and demolished in the 1920s. The Will of Henry Hunloke written in 1711 specifies that his wife Catherine was to receive all his jewels and 'all the furniture in the chamber where now she lies..the dressing plate standing upon her toilet'. 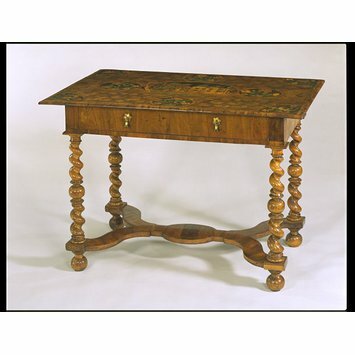 Recommends the purchase of this Charles II table. He notes the inlaid representation of Wingerworth Hall, Derbyshire before the present hall was built by Smith of Warwick in 1713. Edwards notes that "the table is shown in (his) Country Life illustration of (his) hall at Wingerworth but (even) if one discounts the allegation his representation of a house in Charles II ( ) is most exceptional and this table is a very desirable acquisition on other grounds". Historical significance: This is a rare English depiction of a specific house in marquetry, although idealised architecture featured prominently in inlay decoration thought to have been produced in Southwark around 1600. The craftsman must have worked from a topographical engraving or drawing of the house. The strapwork frame to the roundels and central medallion forms a continuous interweaving line which pulls the whole composition together. The twisted spiral effect of the legs is ultimately derived from Solomonic columns as exemplified in the Raphael cartoons in the English Royal Collection. Another later example - in the form of a painted oval table is at West Wycombe, Buckinghamshire. Table decorated with oyster veneer and marquetry panels, including one representing Wingerworth Old Hall. English, 1674. Various letters also located in dept files.